This easy Apricot Chicken recipe is sweet, tangy, sticky and full of flavor! 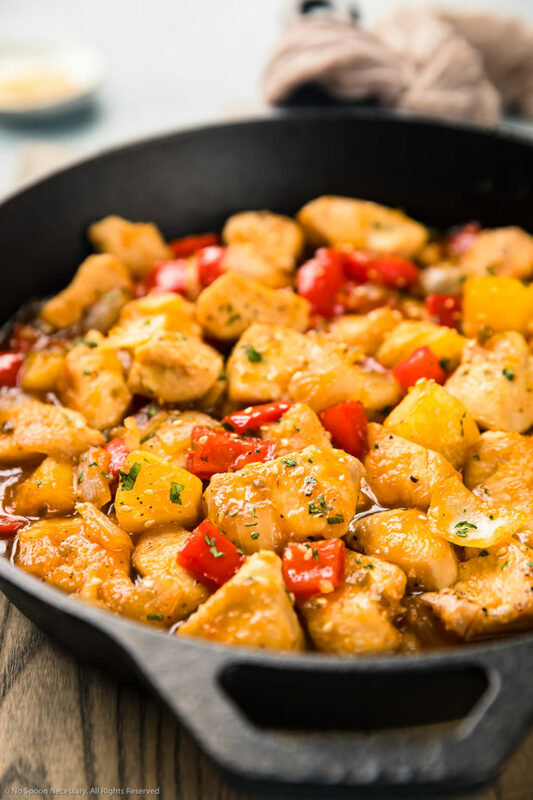 Stir-fried with onions, peppers and pineapples, and ready in 20 minutes or less, this chicken is a delicious way to spice up boring dinners! 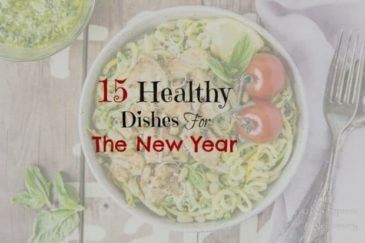 As much as I love chicken for dinner, because it is cheap, healthy, and easy to throw together, it can also be extremely boring and awfully bland. 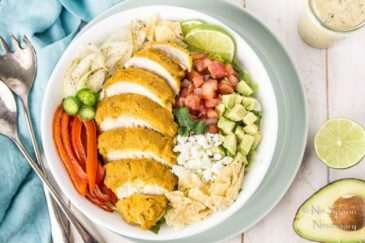 Well, today we are going to get out of our chicken dinner rut, shake things up a bit and take chicken to the next level of yum! Succulent pieces of chicken breast, tender-crisp peppers, fragrant onions, mild jalapeños and juicy chunks of pineapple stir-fried in a fruity, tangy, sweet and slightly spicy apricot sauce. 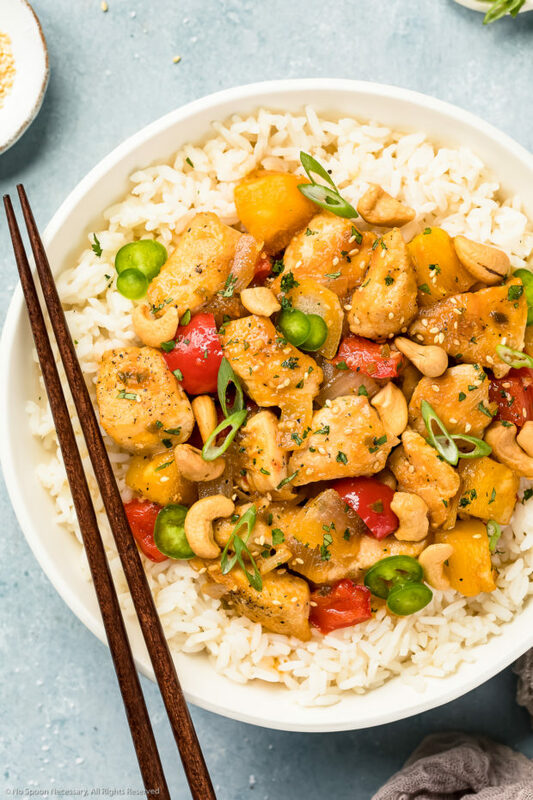 Served on a bed of fluffy white or brown rice and garnished with crunchy cashews and fresh herbs, this dish is saucy and super flavorful! 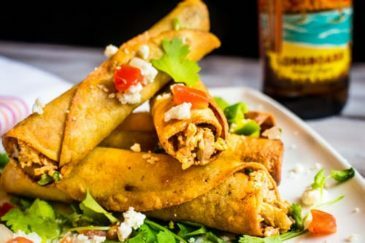 Quick and easy to prepare, and light yet filling, it’s perfect for hectic weeknight dinners! 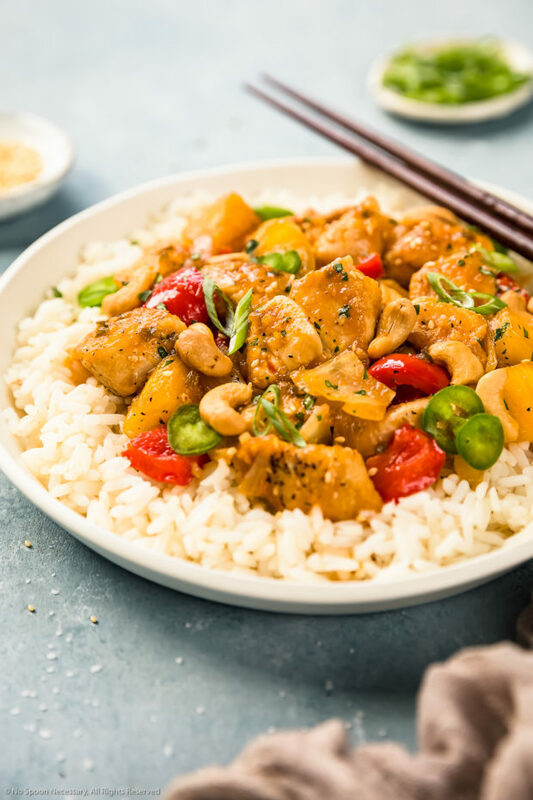 Apricot chicken is an easy, flavorful dish that is fruity, tangy and sweet in flavor with an apricot forward taste. This fruity chicken can be made with real or dried apricots as well as apricot preserves. As well, depending on the recipe, the chicken can be baked, stir-fried or made in a slow cooker. With a tantalizing aroma, this sweet chicken is incredibly tasty yet simple to prepare and perfect for weeknight meals! How to make apricot chicken sauce? While there are a few different ways to make apricot sauce for chicken, this recipe is all about effortlessness yet bold, balanced flavor! To make apricot sauce simply whisk together apricot preserves with brown sugar, soy sauce, rice vinegar and sriracha. Season the sauce to taste with salt and pepper, and whisk until the sauce is smooth. 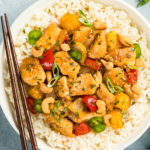 What do you serve with apricot chicken? 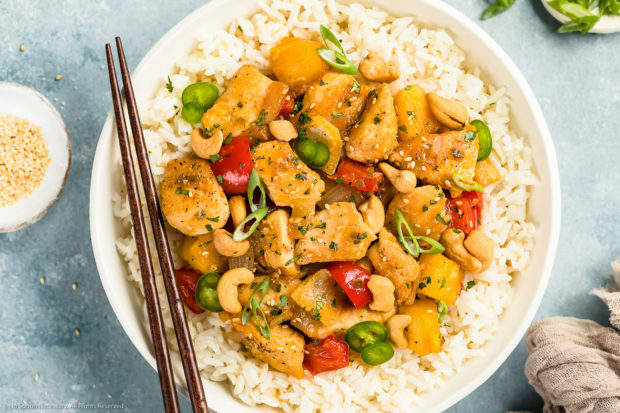 Apricot chicken pairs exceptionally well with any grain. Since the apricot sauce is delicious, you want to serve it with something to soak up all that amazing, sticky sauce! What vegetables go with apricot chicken? What herbs go with apricot chicken? 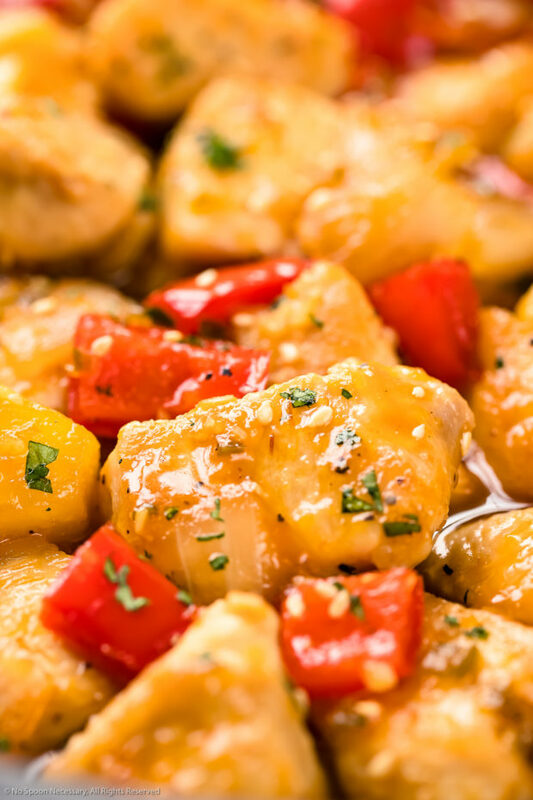 There are a variety of fresh herbs that pair well with the complex, sweet and tart flavors of apricot chicken! 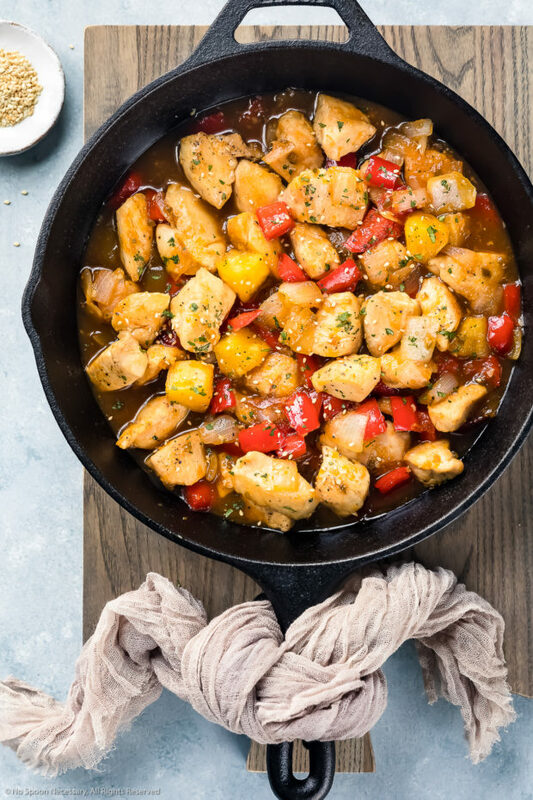 This chicken recipe is made with lean chicken breasts stir-fried with onions, peppers and chunks of pineapple. 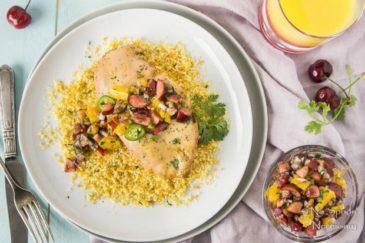 Packed with protein plus rich in vitamins and antioxidants, apricot chicken is a healthier option for dinner! Can you freeze apricot chicken? While I wouldn’t recommend freezing the cooked stir-fry, however you can definitely freeze this chicken as a meal prep and make your own frozen stir-fry meal kit! Having your freezer stocked with a few of these ready-made chicken stir-fry meals makes it easy to get dinner on the table quickly during the busy work week! Poach and slice the chicken. Chop the vegetables according to the recipe directions. Place the chicken and vegetables on a parchment paper lined sheet pan in a single layer. Transfer the pan to the freezer and freeze until solid. Place the chicken and vegetables in separate freezer safe zip-closure bags. Prepare the sauce according to the recipe directions and transfer it to a freezer safe zip-closure bag (make sure to remove as much air as possible before sealing). Place all the bags in a larger freezer bag and store in the freezer for up to 3 months. While the recipe below calls for chicken breasts, you can substitute boneless skinless chicken thighs. Just make sure you cook the chicken in step 3 until it is golden brown and almost cooked through. If you aren’t a fan of spicy food, choose jalapeños that are smooth with zero white lines. The smoother a jalapeño, the younger and more mild it is. Also, make sure you completely seed and fully remove the ribs from the jalapeños as that is the source of the heat. As well, omit the sriracha from the apricot sauce. Once you start cooking, this stir-fry recipe goes really quickly, so make sure you have everything prepped and ready to go before you start cooking! Quick to prepare, easy to make and downright delicious, this Apricot Chicken will become a staple in your house! Until next week, friends, cheers – to stepping up your dinner game! Make the sauce: In a small bowl, whisk together apricot preserves, brown sugar, soy sauce, vinegar and sriracha. Season to taste with salt and pepper. Whisk until smooth. Set aside. Cook chicken: Heat a large skillet over medium-high heat, and add 2 tablespoons of oil, swirling to coat. Add the chicken to the skillet, in batches if necessary to not overcrowd the pan. Cook the chicken until golden until golden and almost cooked through, about 4-5 minutes. Remove chicken from pan and set aside. Cook veggies: Add the remaining tablespoon of oil to the pan, and add the onions and bell peppers. Season with salt and pepper. Cook, stirring until slightly softened, about 2 minutes. Add in the jalapeno and cook another minute. Add in the garlic and ginger and cook until fragrant, about 1 minute. Add the chicken along with the apricot sauce and pineapple to the pan. Toss everything well to coat. Simmer for 2-3 minutes, or until chicken is cooked through and sauce is thickened. Taste and adjust for seasoning with salt and pepper. Serve chicken over rice immediately, garnished with sliced jalapenos, sesame seeds and fresh herbs if desired. Enjoy! If you aren't a fan of spicy food, choose jalapeños that are smooth with zero white lines. The smoother a jalapeño, the younger and more mild it is. Also, make sure you completely seed and fully remove the ribs from the jalapeños as that is the source of the heat. As well, omit the sriracha from the apricot sauce. Yep, we have chicken at least one night a week. So I’m always looking for inspiration and this looks incredible!! And you know I’m all over how easy it is to make too! Sweet and tangy all in one, definitely calling my name here! Can’t be beat! Chicken? You can count on all my raised hands, Chey 🙂 Most of my lunches are a simple salad with chicken breasts, and we’ve been having soup (which is normally chicken-based) for most dinners for the last 4 months or so (Congrats on the arrival of spring by the way!) And of course I do love this fancy dish with a delicious apricot sauce. 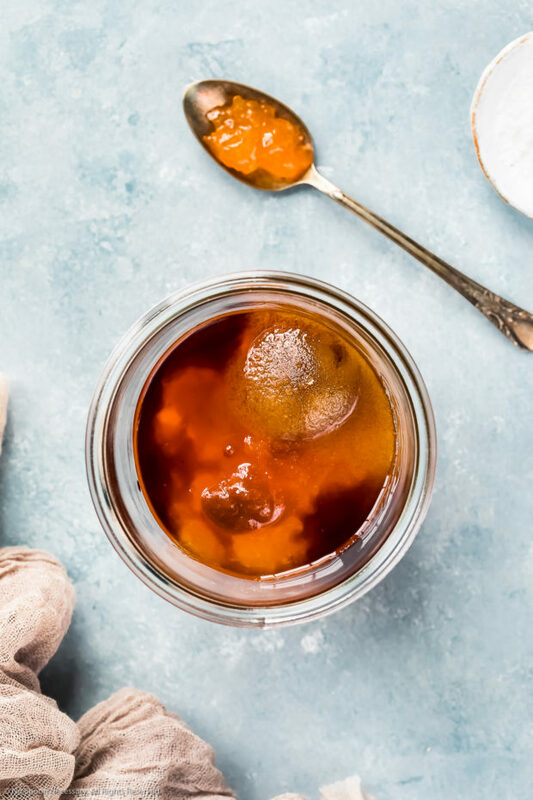 I sometimes add dried apricots into chicken recipes, but the idea of using preserves sounds even better – sweet and luscious. Beautiful! I always love fruit with chicken! There is something about that tangy flavour that complements it so well and never, ever boring 🙂 Looks perfect! We enjoy chicken at least once a week Chey, and I’m always looking for ways to spice it up! My boys are starting to cook more for themselves too and they’re always looking for new recipes. Sean, our oldest, LOVES apricot anything. I can’t wait to send him this recipe. We’re all going to love it. Pinned and can’t wait to try! This reminds me of my favourite orange chicken. I must try it with apricot preserves next time too as it turned out really great, Chey.